To be fair, this is more of a minor nuisance than a problem per se — these two emoji were only ever available to a limited number of users under an alpha version of Android, and even if they were removed, it wouldn't be the first feature Google had introduced and removed in Android N. On top of that, since these candidates were withdrawn so late into the approval stage, they will still be encoded into Unicode 9 under the same character codes (U+1F946 for the rifle and U+1F93B for the modern pentathlon emoji). Formally, the only difference is that they will now be classified as symbols (which are drawn in black and white, like ♘ and ♚) instead of emoji. By that logic, there's really not much reason for Google to actually remove support for either character, since they'll both continue being encoded into the Unicode Standard. 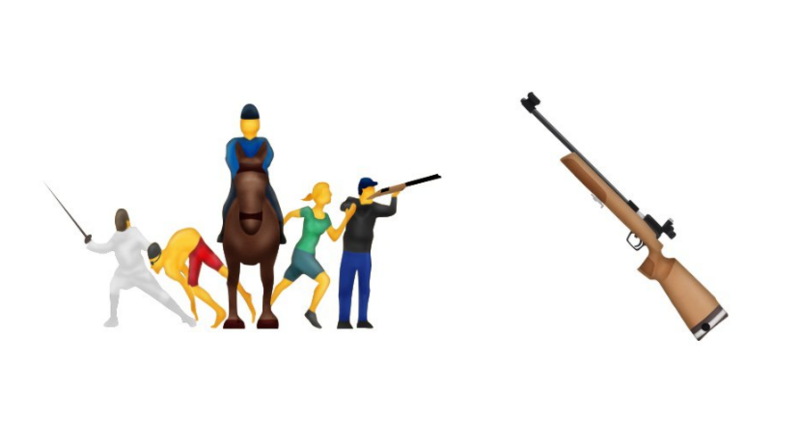 It's not clear why the committee decided to backtrack on these two particular candidates, but one reason for the modern pentathlon emoji might have to do with the difficulty in coming up with a suitable sample glyph that had low visual clutter. A pentathlon is a sporting event involving fencing, shooting, swimming, riding, and cross-country running — attempting to fit all that information into a single glyph had already led to vendors adopting wildly different representations of this particular emoji. Google, for instance, decided to only depict riding out of the five sports, and Emoji One seems to have given up and just gone with wrestling instead. The next change to the Unicode Standard should come in a year's time with Unicode 10, which currently includes proposals such as orange heart, curling stone, and my favorite, face with raised eyebrow. If you're into that sort of thing, you can find out more about these and other emoji candidates on Emojipedia or on Unicode.org.